The numerical model of the plant has been developed during the first steps of the project aiming at optimization and prediction of plant performances. It has been built according to the previous experience of the partners in other plants (e.g. Lillo, 1 MWe) and design data. After few months of operation, the preliminary on-field measurements are available and they have been used for validation of modelling results and performances assessment. Modelled stack performances are compared with actual voltages at given currents under real operating conditions, assuming fixed hydrogen and air flows. The comparison shows that the Beginning of Life (BoL) voltage at nominal current is well modeled (errors around 5 mV corresponding to 1-2%). The modeling results of the BOP are also checked against measured data. Most deviations are within 2%. The full load energy balance is shown in below figure, also evidencing the theoretical heat recovery capacity of the plant. Finally the performances of the plant are computed for roughly 1000 hours of operation of the plant, for which comparison data are available at partial load (1.7 MWe). Globally, the plant electrical efficiency remains around 56-57% (gross electrical efficiency) and around 50% (net electrical efficiency), yielding a net overall (electrical and thermal efficiency) of 80%. 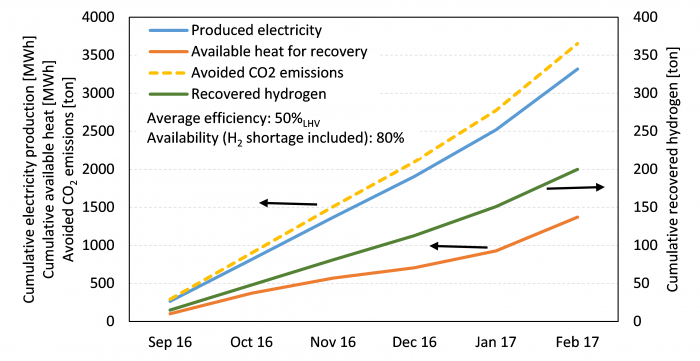 During the first sixth months of operation, more than 3.3 GWhel have been produced and the heat available for recovery has been about 1.4 GWhth. Operational hours are show about 80% up time, which is quite good for this initial period as it was also influenced by the availability of high-quality hydrogen from the upstream industrial plant. The validated model will be now applied to different operating conditions to evidence possible improvements in plant layout and operation strategies for further cost reductions and developments. This article has been written by Politecnico Milano.